Businesses are embracing new types of content to expand their internet marketing strategies, and ebooks are taking off. In 2013, 32 percent of B2B companies and 28 percent of B2Cs plan to use ebooks in their content marketing. There is also growing awareness that ebooks are effective for both business- and consumer-facing brands, with around 55 percent of marketers giving the format a vote of approval. Similar to white papers, these are long-form documents that tackle dense topics with depth. But ebooks are better solutions when marketers want to create comprehensive, yet approachable resources for their customers and prospects. These forms are best suited for lengthy outlines covering a breadth of ideas, step-by-step playbooks or how-to guides with multiple sections. How are ebooks different from white papers? 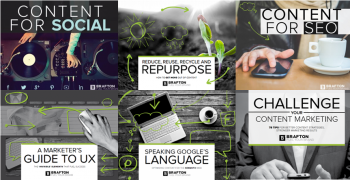 Click to view Brafton’s ebook archives. Unlike white papers, ebooks are often formatted with graphics and statistics to give readers easily digestible information. The idea is that web users can pick up the documents, quickly find the data they need and return to the ebook later. White papers are usually meant to be read in one sitting. Search crawlers can’t index the pages of an ebook PDF or downloadable file format, but they still provide rich SEO value. Brands that create ebooks can publish them online and share them with customers, industry insiders and prospects. Respected resources that link to the company’s ebook are essentially giving the site a positive vote, which Google takes into consideration for page rankings. Moreover, it’s best practice to create resources around the ebook, which promote the valuable resource and add SEO value. News articles or blog content that mention the ebook can be crawled and indexed for search results, while landing pages optimized with keywords might also rank for relevant queries, sending internet users directly to the brands’ publications. Marketers can also use their ebooks to generate leads and conversions, offering resources as free downloads when visitors’ provide their contact data. This builds stronger contact lists for email campaigns and marketing outreach. Ebooks that are rich with data and insights, can provide qualified leads with just the right information they need to convert.